I'm a sucker for a pretty tea towel so I was a bit smitten when I saw Celina Mancurti's Etsy shop. Originally from Buenos Aires, Celina now lives in Tampa, Florida where she is creating a home collection that is both eco-friendly and sustainable. This pink tea towel with a chicken may be my favorite. It's hand-screen printed, 100% linen and has a cotton loop with a vintage button attached. She also offers yards of her pretty printed linens for you to do as you wish. She offers 18 different tea towels in all. Her inspiration comes through her travels, her native home in Argentina and of course, mother nature. All of her linens are made from the fibers of the flax plant and are eco-friendly. This lovely table runner is $50. 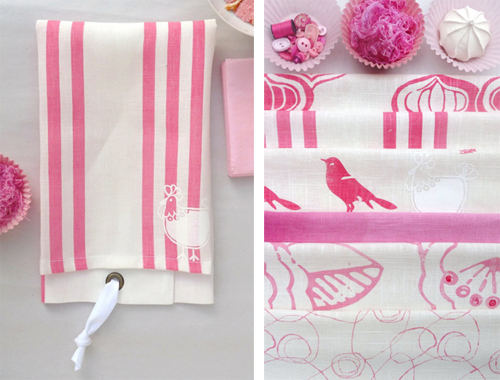 Peruse Celina's site to see her ever expanding line of pretty linens, which also include tablecloths, napkins and aprons.